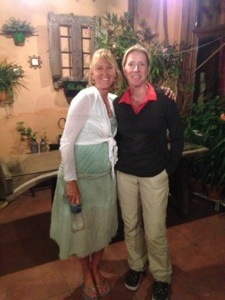 A trip to Africa has always been on the bucket list for Kathryn and me. With one of Kathryn’s “zero” birthdays approaching this month, we decided to start planning a trip last fall. We were inspired by several friends who had returned from trips in 2016 or were planning ones in 2017. Our first step was to research different locations and the best times to travel. Kathryn is a big fan of waterfalls so Victoria Falls was a required stop on our trip. With that as a center point we decided to visit Botswana west of the falls and Zimbabwe east of the falls. We made a deposit on a trip with Overseas Adventure Travel that allowed a full refund within three weeks. With the OAT trip as a fallback, we contacted friends and family to see who might be interested in joining us on the trip. We also started researching alternative tours that might provide better value or more interesting destinations. Within two weeks we had identified a custom tour agent in London and confirmed that our friend Pat was interested in joining us. By Christmas 2016 we had made a deposit on a custom 14-day trip with Simon Mills at Native Escapes. www.nativeescapes.com Simon was able to put a very high-end experience together for about the same price as OAT. He also was able to keep the single supplement for our friend down to only 5% over the double rate. 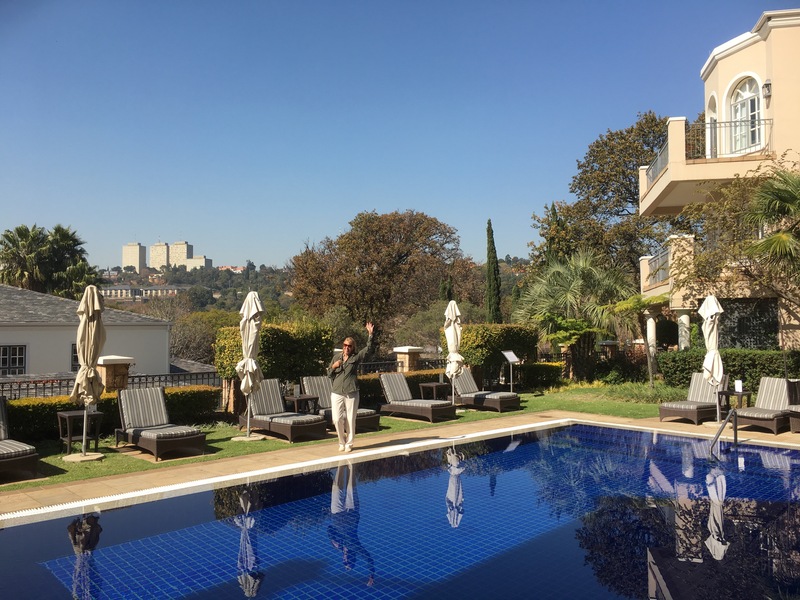 We finished our trip planning by booking flights using our Delta SkyMiles and an overnight stay at The Four Seasons Hotel in Johannesburg after our 24-hour journey from LAX to South Africa. My niece Nora was working at the Four Seasons in Atlanta at the time and hooked us up with a killer deal. Thank you Nora! After that we didn’t worry about anything until we had to pay for the balance of the trip in March and get our vaccinations up to date in May. A word about the vaccination process. Most regular doctors don’t offer travel medicine services so you need to go to a specialist. Kathryn and I went to Passport Health which has offices nationwide. It cost $95 for us combined but the vaccination costs were really high so we ended up going to Costco and saved about 50%. Costco also offers online consultations for $40 pp. On the evening of May 31st we boarded our flight to Johannesburg via London and arrived early in the morning of June 2. We were met at the gate by a rep from the hotel who sped us through customs. After meeting our friend Pat in the baggage area we were soon onboard a private minibus to the hotel. Our entire experience at The Four Seasons Hotel was beyond amazing. Our rooms were ready when we checked in around 10 am. 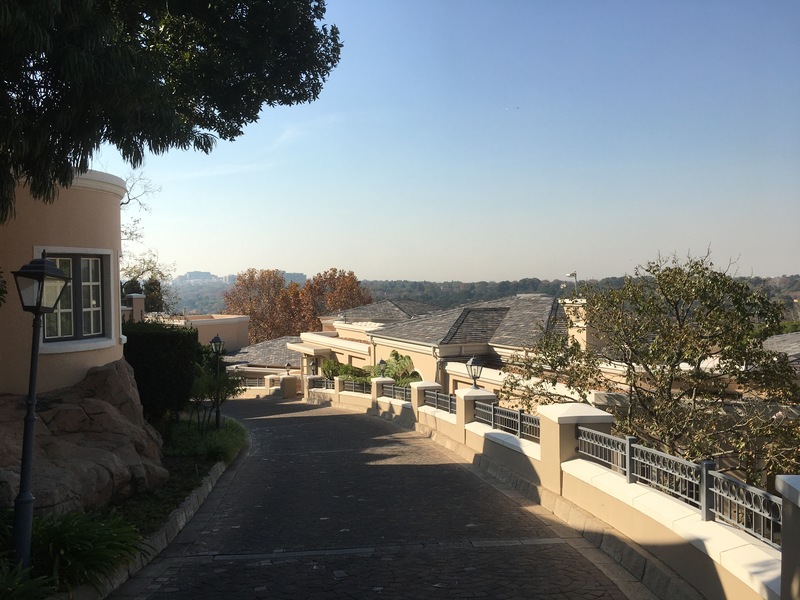 Since we had eaten breakfast on the plane, we grabbed a quick cup of coffee and toured the property. First stop was the spa where we booked massages for each of us later in the day. Pat was nice enough to pay for our treatments. Thank you Pat! That night we had a great meal at the hotel restaurant and a quick game of Blisters before heading back to our rooms for bed. Tomorrow we would be flying north to Botswana. 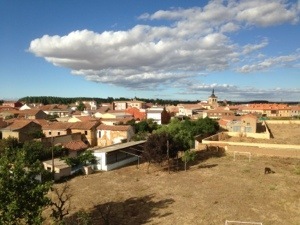 It’s now been seventeen days since I returned home from Spain. During that time I’ve tried to hang onto my experience as the the usual bombardment of modern culture continues unabated. My focus has been on relaxation characterized by the avoidance of scheduled activity. During this 17-day period, I’ve relaxed at home for a few days, spent the long Labor Day weekend on Balboa Island, launched our son into the 11th grade and took four days to go fishing in the Sierra mountains. After that, a few days focused on our oldest son’s upcoming wedding and then back to Balboa Island where I now attempt to share my oft-promised deep thoughts about my experience traveling around the world in 30 days. Or in your heart. Or in your head. This thought has been shared by many folks before me and I think is common to almost all Camino experiences. The accumulation of “stuff” over time is not the way to happiness, it is an obstacle to happiness. I actually prefer to use the word contentment because it connotes a peaceful acceptance of wherever and whatever you are in life right now. It’s the feeling that you have enough, you do enough and you are enough. Being an avid backpacker for many years, I’ve learned this lesson slowly. In the early days, I carried a lot of extra equipment “just in case” and tolerated the extra burden because I was a younger man. As I’ve aged, I’ve cut my pack weight slowly but steadily. It’s the only thing that has allowed me to continue my trips. 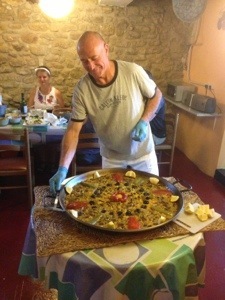 The Camino experience magnified what I learned backpacking. Instead of 30 lbs. you’re carrying 15 lbs. You can do this, of course, because more of what you need is provided along the way by others. Food and shelter don’t need to be carried, you purchase them as you go along. If you get hurt, you’re usually within a few hours of a hospital so you don’t need to carry a lot of first aid gear. All you really need is a medium-sized backpack, an open mind, and an open heart. Which leads us to Deep Thought #2. Right about now you’re thinking: is Michael going to have an original thought anywhere in this post? The answer is: I’m not sure so stay tuned. I’m reading a book right now entitled “Fly Fishing – the Sacred Art: Casting a Fly as a Spiritual Practice.” It’s written by a Christian minister/MD named Michael Attas and a rabbi named Eric Eisenkramer. The book combines some basic fly-fishing instruction with thoughts about the wonder of the natural world, the benefits of solitude, the blessing of community and the search for the Divine. Sounds just like my Camino experience. One of the concepts discussed in the book is panentheism, which “makes the claim that God is in all matter and all of creation. 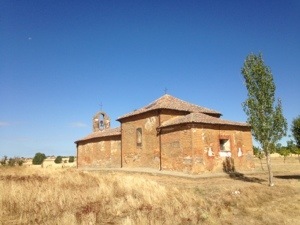 All humans have this spark of divinity within us, as does all matter – earth, waters, fish, birds, forests, and trees.” It’s easier to recognize this on the Camino because everyone and everything is carrying less stuff. 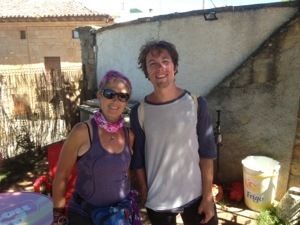 Walking the Camino, you meet people from all over the world and you never know who is rich and who is poor. They’ve left their stuff behind and chosen to carry their possessions on their back. It’s a great equalizer. 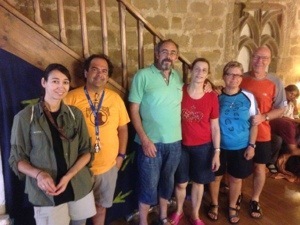 When you meet someone on the Camino, the spark of the Divine is usually apparent immediately. It’s like whoa! This guy is the most amazing person I’ve ever met! Until you meet the next person, of course. If you don’t notice their spark, it’s usually because you’re not paying attention. Not that that ever happened to me. Once you start noticing the Divine in everyone, it’s easy to notice the Divine in everything around you. Fields of sunflowers, hunting dogs, purple stuffed animals, bicycles, beer. You don’t need to search for the Divine. 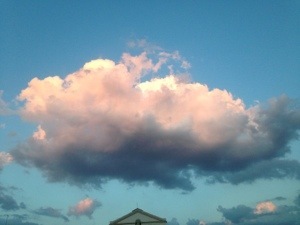 Get rid of your stuff and the Divine fills the void. It’s been five days since I returned home from my round-the-world adventure. 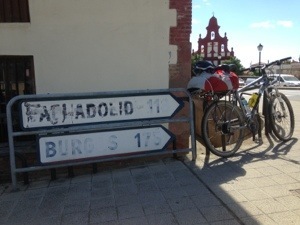 Having walked and cycled about 280 miles of the Camino de Santiago, it’s an appropriate time to share a few thoughts about what I’ve learned from the experience. Unless you’re walking the distance you plan to walk each day, and then repeat that for the number of days you plan to walk without a break, you have not trained properly. Add to that the need to replicate the terrain, trail surfaces and weather conditions of the Camino, and the ability to prepare yourself adequately becomes impossible. 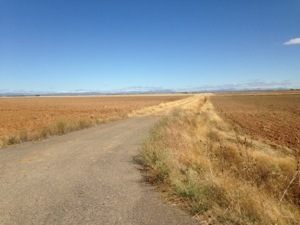 You may be a stud or studette on your home turf, but the Camino experience is different. I believe the best way to train is 6 days of walking a variety of conditions and distances followed by a rest day. Most pilgrims, of course, do not have the time to do this (I surely didn’t) so that leads us to observation #2. My hiking/walking experience is primarily in the mountains/canyons of the western US. I typically carry 35-40 lbs and hike 5-10 miles a day. My trips typically last 3-5 days. I have been to the top of Mt. Whitney at 14,500 feet and the bottom of the Grand Canyon. I provide this information as background for probably the most important lesson I learned: start slowly and build speed gradually. If you review my blog posts, you’ll see that my average daily speed including all rest stops started around 3.5 km/hr for the first five days. After that, it dropped steadily until it bottomed out around 2.8 km/hr by day #10. Now, you may think that 3.5 km/hr isn’t very fast but the fact is, it was too fast for me to sustain for ten days. Like the disclaimer says, your mileage may vary, but the lesson I learned is to really go slowly for the first week or so. This lesson leads us to #3. You’ll have to have some sort of plan for travel to/from your start/stop points, but other than that, allow your physical and emotional state to dictate your experience. My buddy Nancy summarized it best: “I’ll get there when I get there.” Easy to say but tough to live by, especially for me. 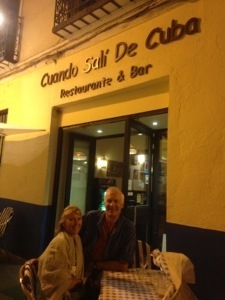 Other than my start and stop dates, I had an intermediate deadline to meet my wife in Burgos on a certain date. That required me to average 13.5 miles/day for 10 days. That mileage was too much for me and I paid the price. Next time I’ll allow at least one flex day per week so that I can rest before I injure myself. The last night in Mansilla de las Mulas, we met a woman who had pre-planned every hotel, breakfast and dinner on her entire camino. I think that worked well for her but I would have been out big money if I had done that. Start each day with a general objective and then adapt to your body, head and heart speaking to you along the way. 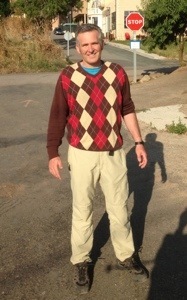 I ended up wearing every item of clothing and all of my sleeping system at various times during my camino. I probably only used about 20% of the “just in case” stuff. 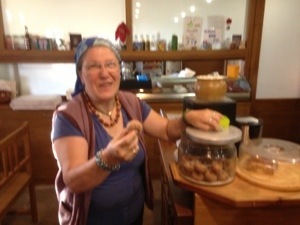 When my camino continues, that’s where I’ll focus my weight saving efforts. I also added water and food items to my pack weight every day. Having bonked during a hike in the Grand Canyon, I tend to carry too much water rather than not enough. That said, is there anywhere I found that I need to carry more than two liters? The answer is no. Regarding food, you can save money by shopping at a supermercado rather than buying food at a roadside bar/restaurant but you’ll have to carry your groceries until you consume them. Consider the weight vs. cost tradeoff. Adding the odd’s and end’s with food and water will quickly take your carefully planned 15 lb. pack to 20+ lbs. #5 – Bring the Mayo and Mustard! Don’t get me wrong. I love sandwiches as much as anyone. But most of the sandwiches you buy in Spain will be dry. That is, devoid of mustard, mayo or other sauces. (Some places will put olive oil and vinegar on theirs.) So before you leave home, pack some individual servings or Grey Poupon (like in the movie), mayo, hot sauce or whatever you slather on two pieces of bread. You’ll thank me for it. 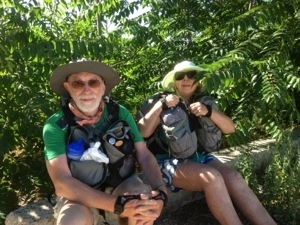 So that’s the practical lessons learned after a half-camino. My next blog will focus on the more abstract things I learned along the way. It’s been a few days since Kathryn and I returned home from Spain and I’ve had some time time to reflect on my round-the-world adventure. 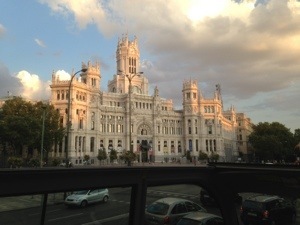 Before I get into that, however, here’s a wrap up of our last night in Madrid. After we arrived at our hotel (Preciados), Kathryn went out to wander the streets and do some shopping while I relaxed and posted on my blog. Since we had to carry whatever we purchased along the way, we had kept our new acquisitions to a bare minimum. Now that we were converting to air travel, we could add a few items to our backpacks. 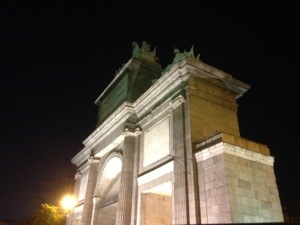 When she returned, we decided to take a tour of the city on an open air double decker bus. We walked over to the bus stop around 8 pm. 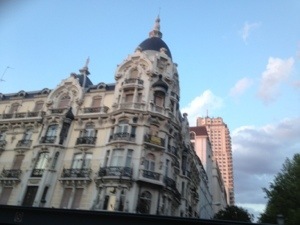 It was a perfect summer evening – the night was warm and Madrid’s streets and parks were filled with people walking, relaxing on the grass and benches, and talking with friends. The tour eventually wound its way to the western part of the downtown area where a large crowd had gathered to watch the sunset. Kathryn and I jumped off the bus to enjoy the show. The setting was a group of government buildings perched on the edge of a 100-foot bluff which allowed a broad view toward the west. 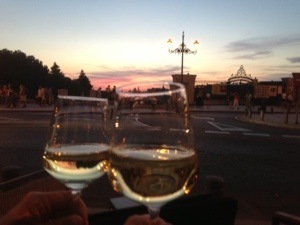 The sunset spectacular lasted about an hour which allowed us to grab a some wine and tapas from a streetside cafe. We got back on another tour bus as it was completing its run for the night but soon jumped off again to check out the Plaza Mayor. First thing I learned in Spain: when in doubt, go to the Plaza Mayor. Every village, town and city has one. 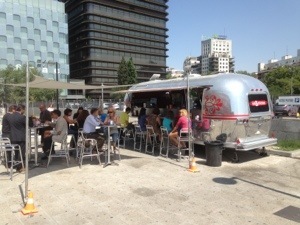 Before we got to the plaza, however, we saw a cool-looking glass building and found a high-end food court inside. 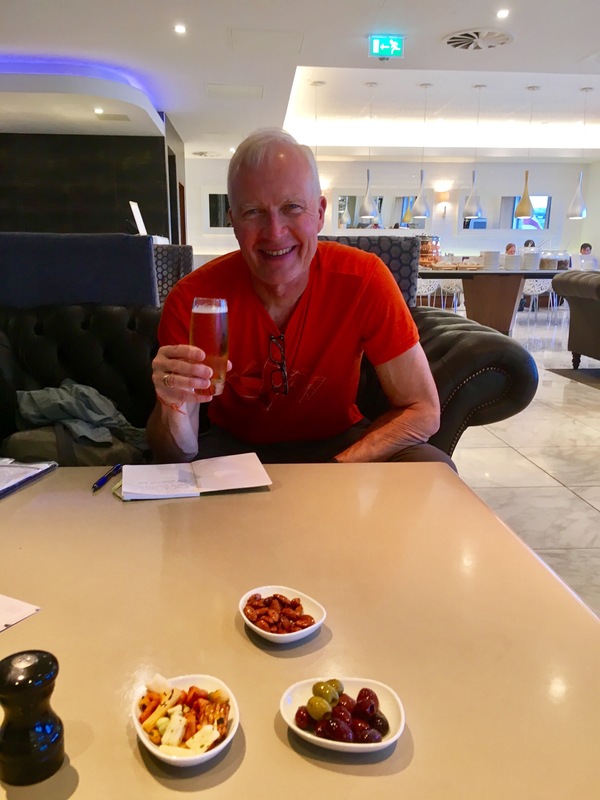 The place was packed with people tasting food and drink from all over Spain and the world – wine, cheese, olives, sushi, chocolates, coffee, tapas, English beers. 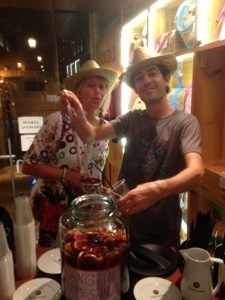 We tasted some Sangria (first of the trip) and got the secret recipe for our future use. 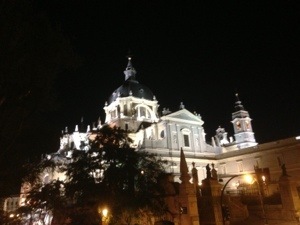 We finally cruised through the Plaza Mayor but didn’t feel the magic of any restaurants so headed back toward our hotel. Just before we got there, we noticed a Cuban restaurant down a small side street, It was a small family-run place and it provided a perfect setting for our last dinner in Spain. The next morning was all business as we packed our bags, had breakfast and took the light rail to the airport. We checked into our flight easily and took off around 1 pm. We had some great seats in the economy plus section and settled in for the 10-hour flight to Dallas. My next post will provide some thoughts on my experience. 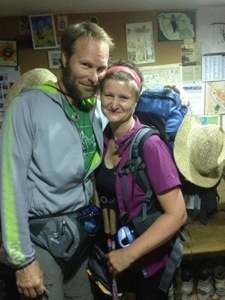 What would a Camino be without getting up before the sun rises and racing to the next albergue? In our case, it was a bit different circumstances. In order to catch our 0935 train from Leon to Madrid, we had to wake up around 0630 to catch the 0750 bus to the Leon train station. 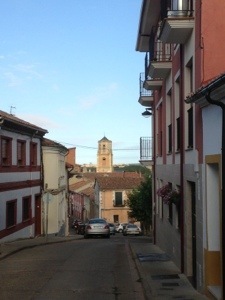 Since the sun doesn’t rise until 0730 or so, Kathryn and I got to walk the streets of Mansilla de las Mulas before dawn. We got to see a few peregrinos on bicycles heading out of town. 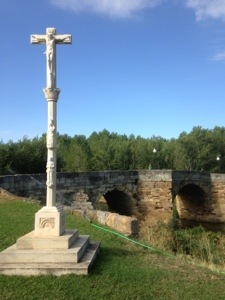 As we took the bus westward toward Leon, we passed a good number of pilgrims walking along the path. Given their distance travelled, we figured they must have been on the road by 0630 or so. 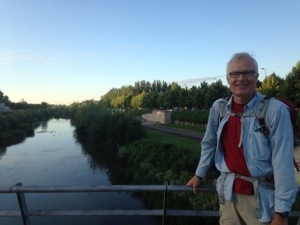 It was only a 20-25 minute ride into the city and we enjoyed a brief walk along the river between the bus station and train station. Our train originated in Gijon on the Atlantic coast and was right on time. Soon we were blasting along at a peak speed of 250 km/hr. 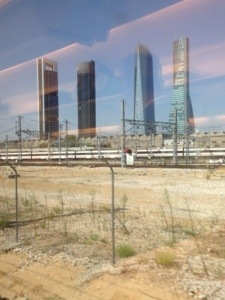 There only a few stops before Madrid and we arrived just after noon. Our first mission of the day was to go back to the Qatar Airways CTO and ask for a refund of the ticket I had to buy between Jakarta and Madrid (see previous post). Luckily they were open this time and couldn’t have been more pleasant and helpful. 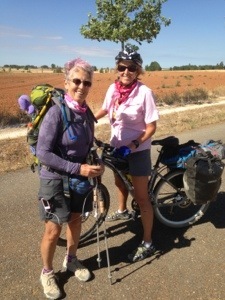 One of the agents saw our scallop shells and asked about our camino experience. With that burden finally resolved, we grabbed some lunch before heading over to our hotel. 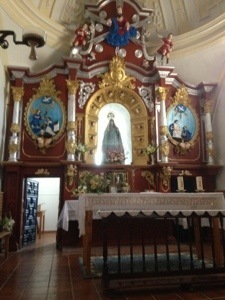 We stayed there last year and it’s located on one of the pedestrian only shopping streets. 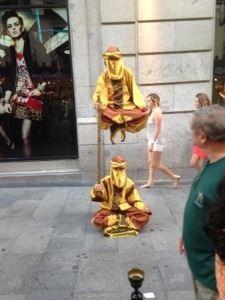 The people watching in Madrid is among the best in the world, and this street is a great place to take it all in. Our plans for tonight are still open. We’ll probably wander around a bit and enjoy the beautiful warm weather and all the activity in the streets near our hotel. 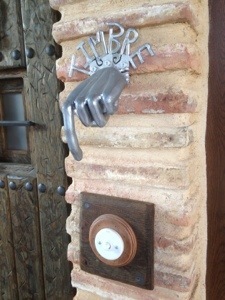 Last night we stayed in a really cool hostal in Sahagun. 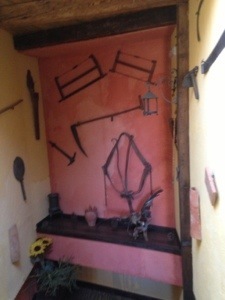 It was very quiet and the place had a lot of soul in the way the rooms were decorated. 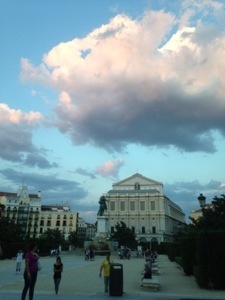 We had arranged to meet our friend Nancy for dinner, so we wandered down to the Plaza Major around 8 pm. 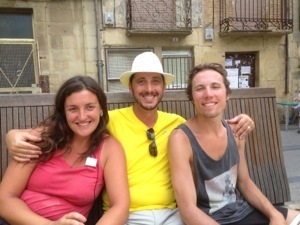 We had last seen her in Burgos one week ago so we had a lot of Camino stories to catch up on. 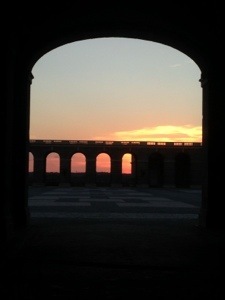 Since we were taking the highway route versus the ancient Roman road, our day today was able to start a little later. 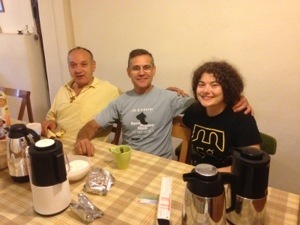 We enjoyed a full breakfast, did a bit of grocery shopping and finally left town around 1030. The highway route features a shaded pathway for walkers and a virtually empty roadway alongside. The landscape reminded me of Montana with rolling wheat fields and mountains in the distance. It might be a little boring for walkers but it was a great cycling route. There were only a few towns so the miles passed quickly. We stopped for a brief snack at a shaded picnic table at the turnoff to Villamarco and then a bit longer for lunch outside Reliegos. 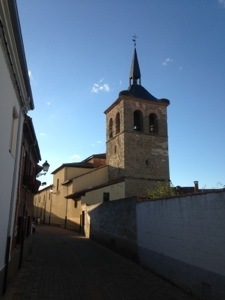 By 2 pm we were entering Mansilla de las Mulas, the final stop on this chapter of our Camino. 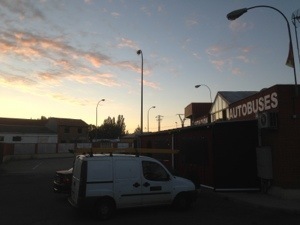 Since our train to Madrid left from Leon at 0930 the next day, we stopped by the Estacion de Autobuses to confirm our bus departure. our guide book had indicated that buses leave every half-hour starting at 0700, but it turned out there was only one bus that would work for us. It would be our earliest wakeup call for the entire trip. We had previously booked a hostal for the evening so that we could coordinate the drop off of our bicycles. The price was a little higher than we been paying but the place was great and the owner Javier went out of his way to take care of our needs. The afternoon was spent getting the bikes ready for transport, taking showers, doing laundry and relaxing. 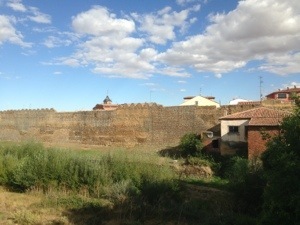 Later in the day we took a walk over to the rio Esla and strolled along the walls of the medieval city. 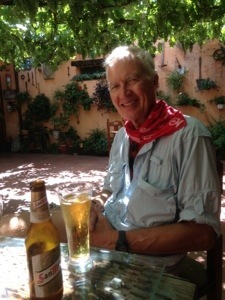 After a beer at an albergue with a really nice garden, we went back to our hostal and enjoyed a quiet dinner on the patio with Bach playing in the background. The menu was priced like a typical menu peregrino but the food was unique to the region. 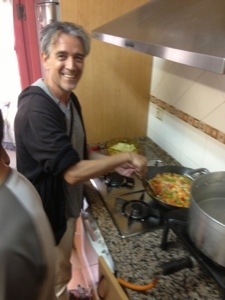 We enjoyed gazpacho, tomato salad, and rabbit. At the next table, we got to know Michaela from Germany. 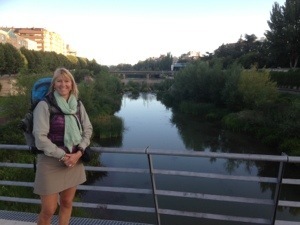 She had started her Camino in Logrono and planned to take about 30 days to reach Santiago. 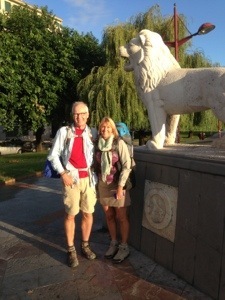 Unlike other pilgrims we had met, Michaela had pre-arranged her entire trip, including hotels, meals and daily baggage transport. She shuddered when I described sleeping on mattresses on the floor next to other pilgrims. 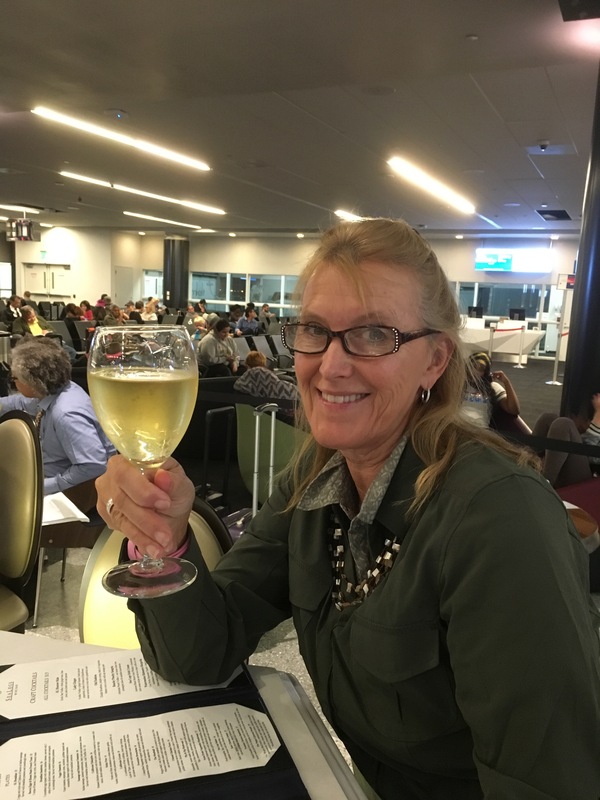 It would be easy to dismiss her as a tourist rather than a “true pilgrim,” but it was obvious that this journey was a stretch from her usual comfort zone. 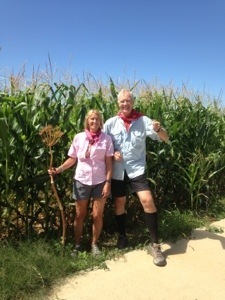 I think her Camino will be just as important as all the other pilgrims I’ve met. Tomorrow morning we start our journey back to the United States. I mentioned in a previous post that I would have some deep thoughts to share. So far, they are still wandering around in my brain. As I head home, I’ll try harder to get them out.